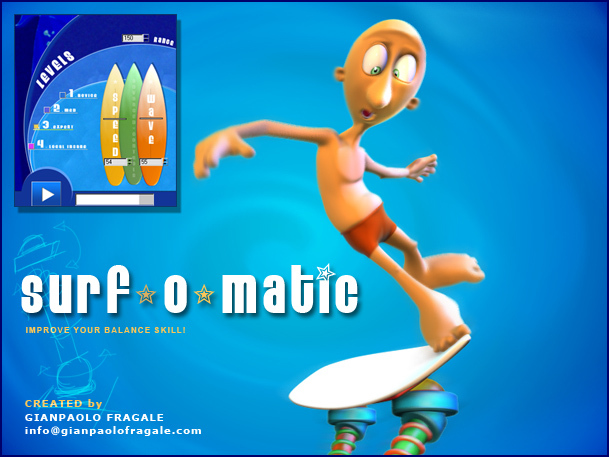 Surf-O-Matic it's a free tool for all ANIMATORS to play with animation principles. Hope it can be a funny way to improve weight shift and balance in animation! If you like it please share with the community. Submitted by islamscience on Fri, 2010-03-19 09:51. Submitted by veneta on Fri, 2010-03-12 10:00. The character for the demo is cool, but as for the script, I think it's more a toy than tool for animators. You can achieve this fx using noise mod's, or if the board follow animated surface then it can be done better with confirm mod's. Submitted by sinokgr on Fri, 2010-03-12 01:21. Submitted by kilad on Thu, 2010-03-11 21:11. Haha that thing is cool.